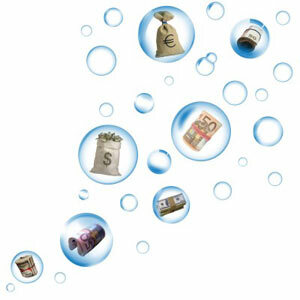 As you get closer to the money bubble, a lot of players will tighten up and try and creep into the money. This can be a strategic mistake, but how you play in this key stage of a sit and go is dependent on your stack size and that’s what we’ll look at in this lesson. The bubble is defined as the time when the players remaining are down to the last remaining place where a player can get eliminated and not receive any prize money. In a normal single table SNG then this is when it is down four players. Since three are paid, the “bubble” will soon burst for one of the four. Bubble play is marked by extreme aggression and large all in confrontations. If the stacks are small relative to the size of the blinds, this period of the SNG is completed very quickly. Depending on the speed with which the first several players were eliminated (and the speed of the increase of the blinds), the average stack at this point could be anywhere from five to twenty big blinds. Somewhere in the middle, around 12 big blinds, is most likely. How you play this stage of the tournament really depends on your stack size. If you are fortunate to have the largest remaining chip stack, you are in a commanding position. You are very likely to make the money, especially if the stacks are small (12 BB or less). Take note of the stacks of the other three players at the table. If the second largest stack is on your right, you have a major advantage acting after them. The second largest stack will be afraid of busting out (if it is an average player), and will avoid confrontations with you, the only player that can knock him out. You can and should attack the two short stacks with all in bets, only backing off when their stacks get below about 3.5 big blinds. Then they are approaching the point of being pot committed and will almost have to call you with any two cards (if they don’t it’s really a mistake), so you want to have a slightly better hand when you know they are going to call. When you are the big stack in the big blind, you generally should respect raises from the second stack, but be prepared to go over the top if you sense weakness (too many raises, for example). If one of the short stacks goes all in, you should call if their push was for 3 big blinds (giving you 3-1 odds on the call) with almost any two cards. Your prime objective as the Big Stack is to eliminate the other players and go into the “In The Money” stage as the chip leader. In typical Sit and Go tournaments, you will find that the big stack gets very aggressive on the bubble. That’s usually their prerogative, and it is usually wise to let them have their way. You can get very aggressive when in the money and try to steal that advantage from them, but for now, if the big stack is aggressive, let them knock out the shorties and cruise into the money yourself. If you are on the big stack’s left, you can take advantage of the times they fold, leaving you as the remaining big stack and then you can play like the big stack, raising to steal as long as the shorties have at least 3 big blinds (giving you some folding equity). Your prime objective as the Second Stack is to avoid confrontation with the Big Stack and cruise through the bubble and into the money. Playing the short stack on the bubble is a tough situation. If you are very short along with a second short stack, then you can be more conservative, hoping for an opportunity to raise all in against the other short stack and/or second stack to steal the blinds or hope the other short stack gets eliminated by another player first. If you are the only short stack, then forget survival. The odds are against you making it in the money without some luck. Don’t let your stack get below 5 big blinds. Pick a spot and move all in and hope to either pick up the blinds or get a lucky double up. Your prime objective as the Short Stack is to pick a spot to move all in and hopefully double up.